From cell-site simulators in New York to facial recognition devices in San Diego, law enforcement surveillance technologies are spreading across the country like an infectious disease. It’s almost epidemiological: one police department will adopt a new, invasive tool, and then the next and the next, often with little or no opportunity for the citizens to weigh in on what’s needed or appropriate for their communities. Sometimes even elected officials and judges have no idea how technologies are being used by the police under their supervision. 2016 is the year we start to turn it around. In California, we helped pass legislation to require transparency and public hearings on technologies such as cell-site simulators and automated license plate readers before they can be adopted by cities and counties. Specifically, earlier this year, the County of Santa Clara passed a groundbreaking ordinance limiting how and when law enforcement can adopt new surveillance technologies. 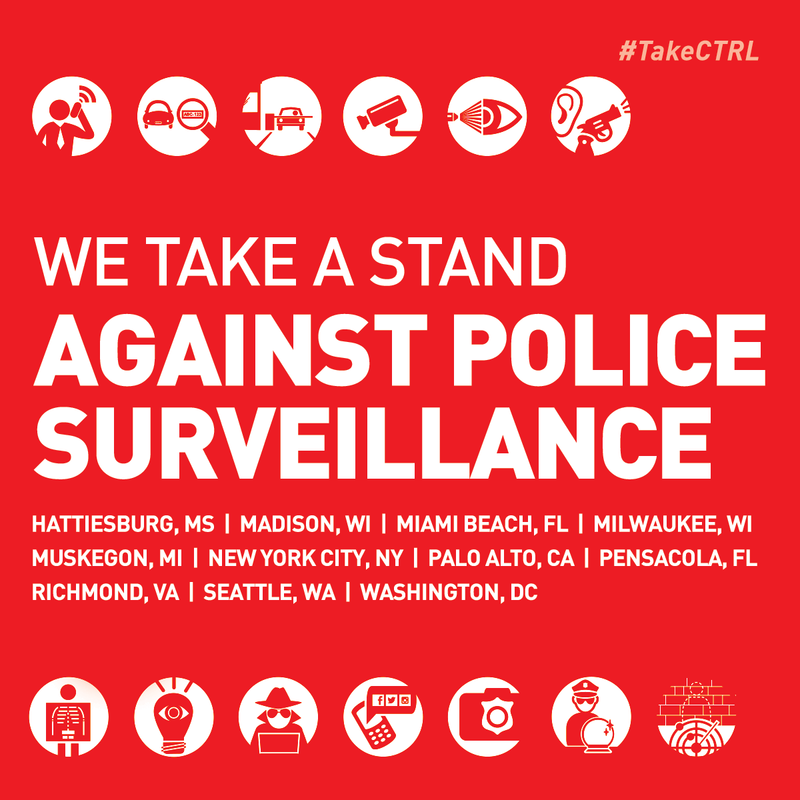 Today, EFF joins the ACLU and a diverse coalition of civil liberties organizations in launching the new campaign for Community Control Over Police Surveillance. This nationwide effort will pass ordinances on the local level that ensure that all affected communities will have a voice in deciding whether police may acquire a new surveillance tool. Without this reform, such decisions too often are made only by local law enforcement officials seeking to acquire the latest, shiny tools; by the federal government seeking to spread “anti-terrorism” funds and its own military-grade tech; and by the vendors aggressively marketing these devices to police departments. 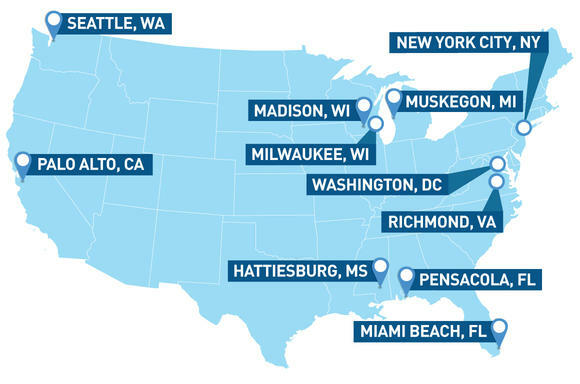 The #TakeCTRL movement seeks to pass ordinances similar to that adopted by Santa Clara in 11 key and politically diverse municipalities across the country: New York City; Washington, D.C.; Richmond, Virginia; Miami Beach and Pensacola, Florida; Hattiesburg, Mississippi; Muskegon, Michigan; Madison and Milwaukee, Wisconsin; Seattle, Washington; and Palo Alto, California. 1) Surveillance technologies should not be funded, acquired, or used without prior express city council approval. 2) Local communities should play a significant and meaningful role in determining if and how surveillance technologies are funded, acquired, or used. 3) The process for considering the use of surveillance technologies should be transparent and well-informed. 4) The use of surveillance technologies should not be approved generally; approvals, if provided, should be for specific technologies and specific, limited uses. 5) Surveillance technologies should not be funded, acquired, or used without addressing their potential impact on civil rights and civil liberties. 6) Surveillance technologies should not be funded, acquired, or used without considering their financial impact. 7) To verify legal compliance, surveillance technology use and deployment data should be reported publically on an annual basis. 8) City council approval should be required for all surveillance technologies and uses; there should be no “grandfathering” for technologies currently in use. This movement is supported by a wide variety of national groups, including EFF, the ACLU, Bill of Rights Defense Committee/Defending Dissent Foundation, Demand Progress, Million Hoodies Movement for Justice, NAACP, National Network of Arab American Communities, Restore the Fourth, South Asian Americans Leading Together, and the Tenth Amendment Center. The increasing, secret use of surveillance technologies by local police, especially against communities of color and other unjustly targeted and politically unpopular groups, is creating oppressive, stigmatizing environments in which every community member is treated like a prospective criminal. The overuse of surveillance technologies has turned many non-white and poor neighborhoods into fishbowls, and some into virtual prisons, where their residents’ public behavior is monitored and scrutinized 24 hours a day. The ACLU has put together the ultimate resource guide for the Community Control Over Police Surveillance at communityctrl.com, where you can learn more about the principles, the technologies, the targeted cities, and how you can get involved. We also encourage you to learn from the work EFF is doing on these issues through our Street-Level Surveillance hub. This effort may not be the ultimate antidote to the plague of invasive police tech, but we believe that it will help build up the antibodies to ensure that our communities become resistant to unchecked surveillance.